Hello again! Yesterday, I mentioned that a friend asked me to make some Christmas cards for her to give to loved ones. This is for her gentleman friend. He is a classy guy, so I picked some earthy tones and elegant touches for him. The Hero Arts tree was stamped on polka dotted paper (in green, of course!) and decorated in teal gems and pearls. 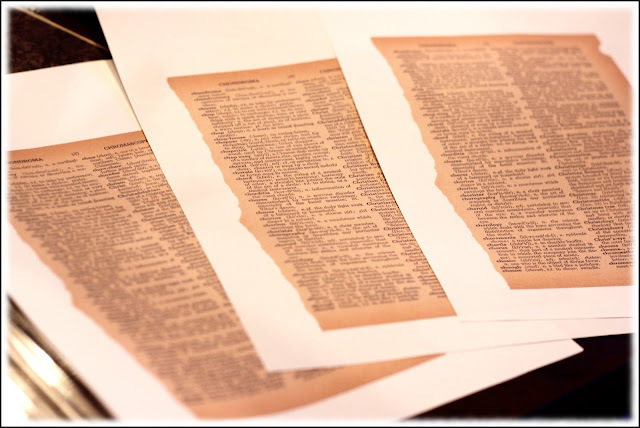 The dictionary page is a photocopy of an original. I bought the 1940s dictionary at a thrift shop in North Carolina on Black Friday this year. 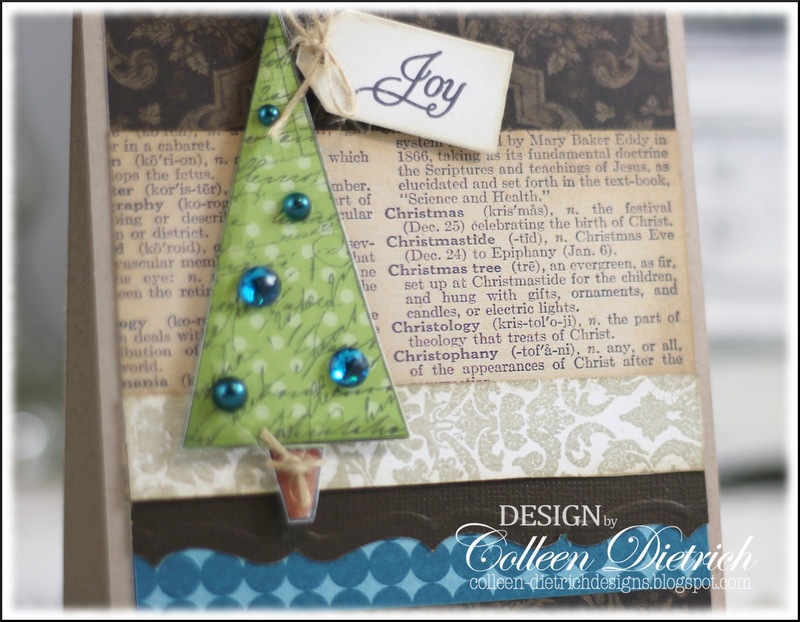 When I set out to make this card, I tore out the page that has the definition for "Christmas tree" and then thought I should photocopy it so I can keep the original. I used several scrap strips of paper that were lying about: the teal dots and Early Espresso (with punched border) from Stampin' Up!, the khaki damask from Market Street Stamps. And shown in the photo below, I intentionally tied a knot in taupe velvet right over top of the Christmas tree, standing in for a star. The sentiment is from Inspired By Stamping on a Memory Box tag. There's a new post up at my photo blog, bleu hydrangea. They're pics of - what else? - Christmas stuff. I hope you enjoy! Wow, this is elegant Colleen! He will love it as will your friend! Merry Christmas to you!! Woa!! 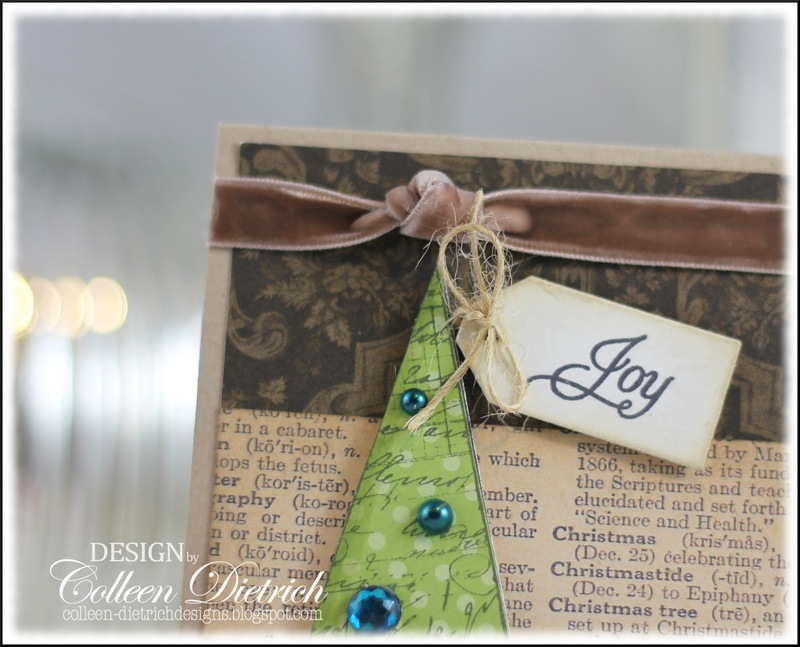 this is such a elegant and stunning card ...i love just about everything about it ...Thank you so much for sharing the tip about the dictionary pages ...what a fab idea !!! WOW!! This is fabulous! LOVE your design and choice of colors - so elegant and beautiful. oh who would think of having a definition of christmas tree on the card?! Genius! This is such an elegant card..love how you used scraps..
lovely! Great idea on the photocopying! This is gorgeous!!!!! I loveeeeeeeeeeee how you added the dictionary page and that tree?!?!??! WOW!! I loveeeeeeeeeeeeeee that tree!! AMAZING!!!!!! wow that is an awesome idea... so creative.. your card is gorgeous..
Love this milk chocolate velvet ribbon with the pops of teal! Great card Colleen!! I love this calendar page and the simple lines of the tree are perfect with it! Awesome card Colleen! 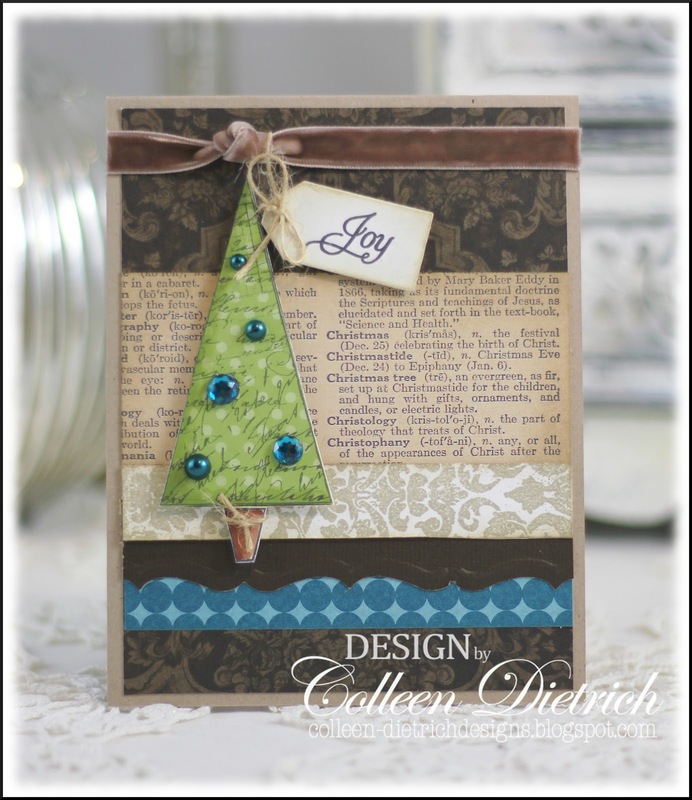 I love the tree with the blue 'ornaments"
Stunning masculine Christmas card! Love the mix of papers, tree, and gems! What a COOL idea to photo copy the Christmas definitions. I love it!! It is such a beautiful card for a man. Your friend should be thrilled! I know I would be. This is a fabulous masculine card. Your colors are perfect. Good thinking making the copies of the page! A very lovely card suitable for a man or woman, in my mind, really. I just adore that tree with the gorgeous teal ornaments, and the photocopy of the dictionary page is brilliant. WOW, this is such a classy Christmas card! I love everything about it! LOVE the colors and the bling on this masculine Christmas card! Merry Christmas, Colleen! Oooo I love this one Colleen!! It is always a little hard for me to make male cards, I am just a girly card type. But this one is such a beauty!! Great work. Your friend is sure to love this card for her gentleman friend. I love to see people use dictionary pages...just adds so much to a card. It's a wonderful masculine creation for Christmas. Love it! I especially like the idea of xeroxing the dictionary page for background. WOW..Gorgeous..!! love the vintage looks of it. Brilliant idea to make our own patterned paper by using some old books. Thank you for playing along with us at Lawnscaping..
Great idea for an elegant masculine card. I can always use ideas... Love the definition page as a background piece, and that brown velvet ribbon is so soft and divine. Gorgeous - and oh so creative with the dictionary pages. What a wonderful inspiration. Hugs and blessings to you and yours - hope it was a wonderful Christmas for you all. BEAUTIFUL card. Completely elegant and gorgeous! Thanks for playing along with us at lawnscaping! Wow! Love the design, elegance and beauty of this card. The blue touches are gorgeous! Such a perfectly lovely idea - thanks for sharing this technique. I love this idea and will definitely use it. I've done telephone pages in the past as background for "phone" cards. If you get a chance, I hope you will stop by and play along with us again this week. I always LOVE having you share your art with us. It's always SO pretty and I love having you share it with us. Wow, what a pretty design! I like the papers you used and your tree is fabulous! Your tree is so fancy! I love those dictionary pages. And look at that pretty velvet ribbon. Wow! Great job, Colleen!